Blue oyster mushrooms are a subspecies of the common pearl oyster that is suited to cold weather growing. As the name suggests, the blue oyster mushroom tends to retain it’s blue hue into maturity. Blue oyster mushrooms can be grown in temperatures as low as 45 degrees Fahrenheit, so they are ideal for growing outdoors late in the season or in early spring when other mushrooms will not grow. Blue oyster mushrooms can even survive freezing temperatures. 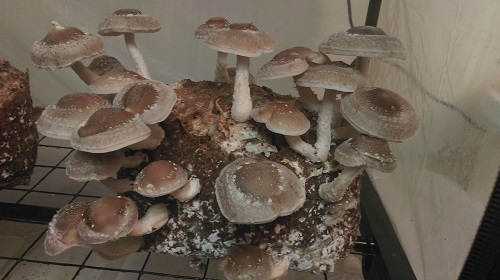 Mushroom growers have had their entire flush of blue oyster mushrooms freeze and continue growing after a thaw. 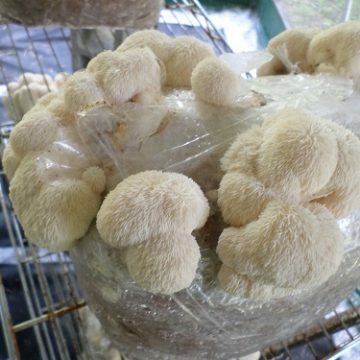 Blue oyster mushrooms will perform best when started in a warmer temperature and subjected to a drop in temperature for fruiting. 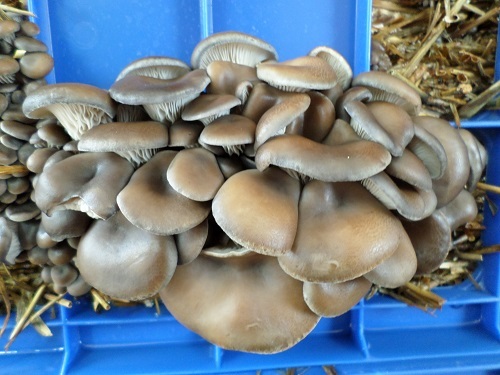 Like the common pearl oyster mushroom, blue oyster mushrooms are versatile and well-suited for beginning growers. 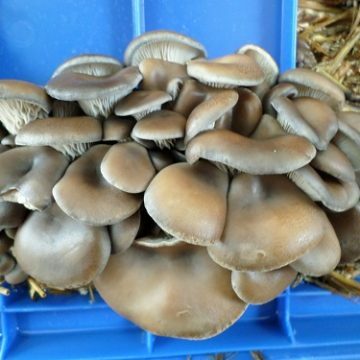 Blue oyster mushrooms can also be grown on a wide variety of substrates, including cardboard and spent coffee grinds. 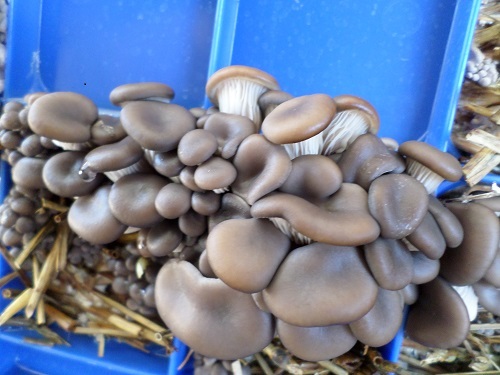 Blue oyster mushrooms are great for children who wish to begin learning how to grow mushrooms, and you can experiment with growing them on unusual objects. 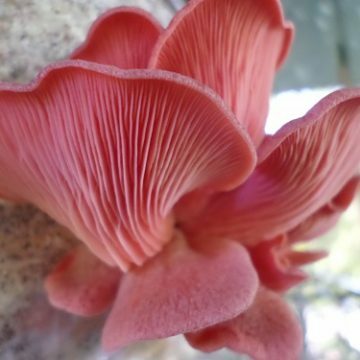 Growers commonly play around with growing oyster mushrooms on everything from phone books to rolls of toilet paper to even fabric, and the blue oyster mushroom is no different. Imagine a stuffed animal with mushrooms growing out of it. When it comes to oyster mushrooms, your imagination is the limit to what kind of fun projects you can try. 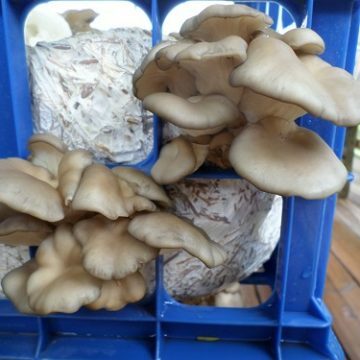 Blue oyster mushrooms are excellent choices for outdoor growing on logs, but they can also be grown in baskets of straw just like pearl oyster mushrooms. 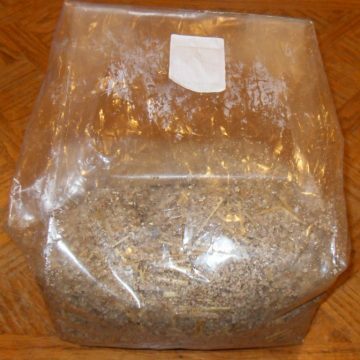 Check out the Let’s Grow Mushrooms video for a step-by-step tutorial of the Laundry Basket straw tek. 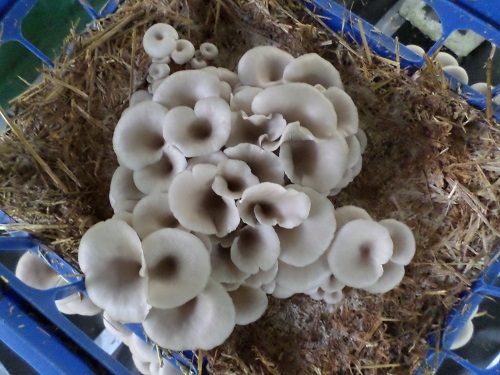 More nutritious substrates will provide the best results, but blue oyster mushrooms offer the opportunity to produce food from waster products such as cardboard, newspaper, sawdust and even nut shells. Blue oyster mushrooms are typically grown outdoors, but some growers do grown them inside. When growing indoors, it is important to maintain proper fresh air exchange. 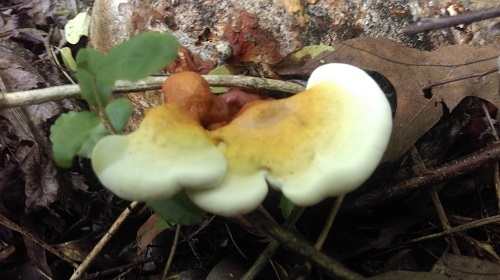 Otherwise, you will get mushrooms with big stems and small caps. The stems of oyster mushrooms are fibrous, which ruins their edible appeal. It is much easier to maintain the air exchange and temperature requirements outdoors. But there are ways of doing this indoors as well. Blue oysters offer the same health support as pearl oysters. Blue oyster mushrooms are rich in anti-oxidants and a wide range of essential minerals. Oyster mushrooms contain more iron than meat, just like actual oysters. An amino acid called ergothionene, which the mushrooms produce, cannot be produced by the human body. Erogthionene must be taken in by diet, and it contributes to immune-building processes within the cells. Blue oyster mushrooms also have anti-bacterial, anti-inflammatory and anti-viral properties. Each item contains one petri dish with a blue oyster mushroom culture culture colonized on MEA substrate.